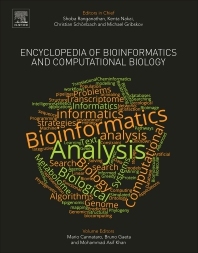 Encyclopedia of Bioinformatics and Computational Biology: ABC of Bioinformatics combines elements of computer science, information technology, mathematics, statistics and biotechnology, providing the methodology and in silico solutions to mine biological data and processes. The book covers Theory, Topics and Applications, with a special focus on Integrative –omics and Systems Biology. The theoretical, methodological underpinnings of BCB, including phylogeny are covered, as are more current areas of focus, such as translational bioinformatics, cheminformatics, and environmental informatics. Finally, Applications provide guidance for commonly asked questions. This major reference work spans basic and cutting-edge methodologies authored by leaders in the field, providing an invaluable resource for students, scientists, professionals in research institutes, and a broad swath of researchers in biotechnology and the biomedical and pharmaceutical industries. Shoba Ranganathan holds a Chair in Bioinformatics at Macquarie University since 2004. After a PhD from the Indian Institute of Technology Delhi, India, in 1983, she took up a post-doctoral position in France. She has held research and academic positions in India, USA, Singapore and Australia, as well as a consultancy in industry. She hosted the Macquarie Node of the ARC Centre of Excellence in Bioinformatics (2008-2013). She was elected the first Australian Board Director of the International Society for Computational Biology (ISCB; 2003-5), President of the Asia-Pacific Bioinformatics Network (2005-) and Steering Committee Member (2007-12) of Bioinformatics Australia. She also serves as Co-Chair of the Computational Mass Spectrometry (CompMS) initiative of the Human Proteome Organization (HuPO), ISCB and Metabolomics Society. Shoba’s research addresses several key areas of bioinformatics to understand biological systems using computational approaches. Her group has achieved both experience and expertise in different aspects of computational biology, ranging from metabolites and small molecules to biochemical networks and pathway analysis. Her group’s current areas of research are protein-protein interactions, structure-based immune epitope prediction, host-parasite interactions and secretome analysis. She has authored as well as edited several books in Immunoinformatics, and contributed several articles to the Encyclopedia of Systems Biology, published by Springer in 2013. Kenta Nakai is Professor at the Human Genome Center, the Institute of Medical Science, the University of Tokyo, Japan. He received his PhD degree from Kyoto University, Japan, in 1992. From 1989, he has worked at several institutions in Japan, including Kyoto University, National Institute of Basic Biology, and Osaka University. He joined the Human Genome Center, the Institute of Medical Science, the University of Tokyo, as Associate Professor in 1999, becoming Professor in 2003. He was elected President of the Japanese Society for Bioinformatics in 2006 and 2007. His main research interest is to develop computational ways to interpret biological information, especially transcriptional regulation. Two of his papers reporting the development of a knowledge-based prediction system of subcellular localization sites have been cited more than 1,200 times so far. He has played a central role in editing the Encyclopedia on Bioinformatics (in Japanese), which was published by Kyoritsu Shuppan Co. Ltd. in 2006. Christian Schönbach is Professor in the Department of Biology, School of Science & Technology, Nazarbayev University, Astana, Kazakhstan and Visiting Professor, Center for AIDS Research, Kumamoto University, Kumamoto, Japan, since 2013. He was awarded Dr. rer. nat. (Genetics) by Eberhard-Karls University, Tübingen (1993), after which he undertook post-doctoral training, at the Department of Tumor Biology, Institute of Medical Science, University of Tokyo. Since then, he has held research positions in Japan and Singapore, in academia, research institutes as well as industry, including Kent Ridge Digital Labs, Singapore and RIKEN Genomic Sciences Center, Yokohama, Japan, prior to becoming Professor, Department of Biology, School of Computer Science and Systems Engineering, Kyushu Institute of Technology, Fukuoka, Japan (2009-2013). He has served as Vice President Conferences of the Asia-Pacific Bioinformatics Network (APBioNet) (2010-present). His research interests include bioinformatics and genomics, data integration and biological knowledge discovery from databases; immunoinformatics and viral immunology; novel peroxisome targeting signal-containing proteins and their role in lipid metabolic/peroxisomal disease pathways; HIV escape mutants, TCR repertoire; bioinformatics transcriptional regulation of the host cell response and immunopathogenesis. His publications have been cited over 7500 times. He has authored and edited several books in Immunoinformatics and Immunomics, as well as contributed to the Encyclopedia of Systems Biology, published by Springer in 2013.